“The Lady in the Van” stars Maggie Smith in a trifle English story that has one of the longest drawn out endings I can recall in a long time and the movie is only 103 minutes! She plays a curmudgeon recreating the role she performed on stage written by Alan Bennett who also wrote this screenplay. The story is of an old woman who lives in a van, parking the vehicle in the driveway of the author. Alex Jennings plays the author and his alter ego who fight over art versus life which presents a distraction throughout the film. The film opens with a loud crash on a black screen and then seeing the window of the van cracked and bloody. Little by little we find out who this homeless, aimless lady was and what brought her to this point in her life. We, also, find out about the crash which really adds nothing to the story but does add to the running time as does a piano concert scene. The supporting players are all excellent English actors who add a touch of class including Jim Broadbent, Frances De La Tour, Deborah Findlay, James Corden and Roger Allam. 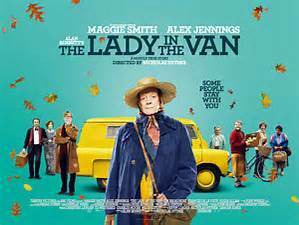 “The Lady in the Van” certainly must have been better in the theatre and this film is only for truly devoted Maggie Smith fans.